Making your own homemade pesto sauce is pretty darn easy. And that means that making your own homemade pesto cream sauce, is pretty darn simple too. In this recipe video, I show you how to make this awesome pasta sauce, which I love with gnocchi and short or stuffed pasta’s like penne and ravioli. It’s a very rich, heavy sauce, so I generally like a small serving and this makes a great appetizer course. Other than salt and pepper, there’s two ingredients – pesto and cream. Obviously, you can use store bought pesto, but if you have the time (about 20 minutes) to make your own, I highly recommend it. Pesto is a fresh, uncooked sauce; and doesn’t get better with a lot of cooking. So add the pesto to the cream just before you add the pasta, and cook it as little as possible. This also means you should time your pasta so it’s cooked when the sauce is ready. 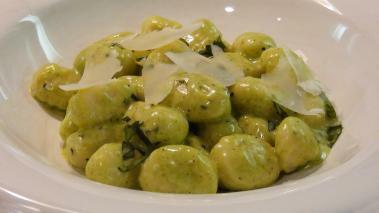 Like many cream sauces, when you mix in the pasta, the starch will help thicken up the sauce. That’s why I keep mine relatively thin (either with a bit of water, or extra cream), knowing that it will thicken quickly. This pesto cream sauce makes a great pasta sauce and that’s how I use it most of the time. However, it is also great with chicken, fish and even a lot of vegetables. Hope you give it a try soon, and leave a comment to let me know how it goes.